Come and enjoy a stay in the charm and authenticity of a historic house from the 16th century, set in the heart of a small of character and a few meters from the town castle. Gather your family and friends at the Maison Arouet with heated swimming pool, spa/jacuzzi, sauna, hammam and fitness room. Nestled in the heart of one of the most beautiful villages of the Deux-Sevres, this historic property opens its doors to a haven of relaxation and wellbeing. Agnes and Didier welcome youto this elegant and refined family house (290 m²), in a peaceful setting. The tastefully decorated interior offers a spacious lounge with a fireplace, a fully equipped kitchen which opens onto the dining room. In the evening, four bedrooms allow you a quiet and restful night's sleep. For more festive moments with family or friends, enjoy the home cinema room which has a large collection of Blu-ray videos-, a small bar and dancing area. Outside, in the heart of the 3000 m² park, which is entirely enclosed by stone walls, enjoy the sunshine on the zen atmosphere terrace. A private swimming pool, heated from April to October, for the enjoyment of parents and children. A large summer kitchen, covered and fully equipped, allows you to share convivial moments with family and friends throughout the seasons. A wellness area of 100 m² with sauna, hammam, spa / jacuzzi, tea lounge and fitness room, for pleasant moments of relaxation or wellbeing. After a swim or a few games in the fully private heated pool at 26 ° minimum, relax in the spa heated to 35 °, detox in the infrared sauna, experience the vapors and enjoy a relaxing herbal tea in the living room. to keep in shape, a fitness room with bike, treadmill, power plate and pilates balls is available. The house is located in the heart of the most beautiful village of Deux Sevres St LOUP LAMAIRE, a small town of character and is situated just a few meters from the castle. This historic house is named after the ancestors of François Marie Arouet says Voltaire who lived there. The shops are nearby. 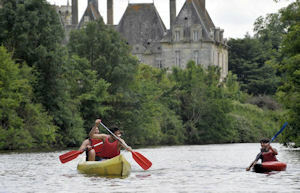 A few steps away are the banks of the river Le Thouet where you can go canoeing or paddle boating. TV, DVD player, -burner gas hob, two oven, microwave, refrigerator, dishwasher, washing machine, coffee machine, electric kettle, toaster, raclette set, vacuum cleaner, iron, hairdryer, baby equipment (cot, high chair, etc), free wifi access. Outside: summer kitchen, barbecue, garden relaxing chairs, sunbeds, private pool heated from april to october, tennis table, trampoline. The house is fabulous, very welle set up, you really will want for nothing. Thank you for a great holiday.We loved the outdoor kitchen, the spa was another highlight! The village is sleepy but that does not matter when you have such an amazing house. For a truly real French Gite experience, this home is a must. Tucked away in the village next to a Boulangerie and village shop, great garden and secure off street parking for two family cars, topped off with the river behind the property. This a lovely holiday home. The owners took care of the linnens ans cleaning leaving us to focus on relaxing. The new Spa next to the pool is great giving something for all of us to try. The house has bags of character with stonework and creaking beams, but with all the mod-cons you would ever need. Highly recommended for a lerger family. Only an hour from Puy du Fou topped it off. 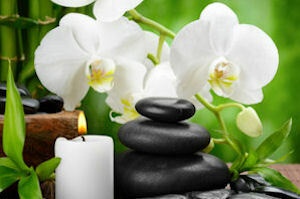 - Close your eyes...Relax...Enjoy a moment of pleasure in the herbal tea salon! Pamper yourself during your stay at La Maison Arouet! To enhance these relaxing moments, we highly recommend the health and beauty treatments provided by our partner 'L'Atelier des Sens' in the comfort of the spa. 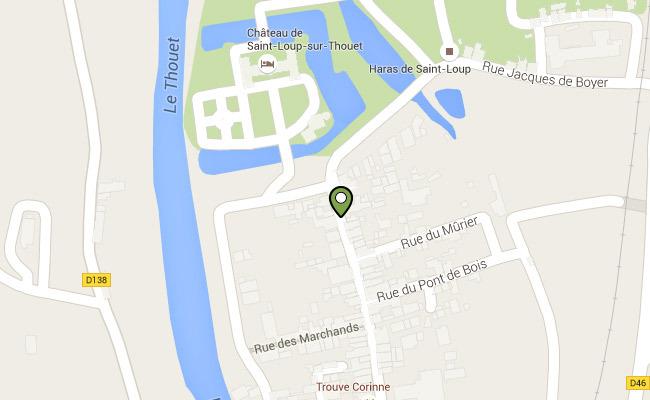 At St Loup Lamairé, just a few minutes walk from la Maison Arouet, enjoy the freedom of a canoe or pedal boat ride. From le Thouet, a secret and mysterious river, you can appreciate the charm and the tranquility of La Gatine from a unique view-point. An exceptional opportunity to share a relaxing moment with family or friends and to discover the rich history of this village, its castle and its valley.